I decided to post one more Christmas card before I do the drawing. You can check out the prize package below and post a comment until this evening. I will draw two names and post them later tonight. Thanks everyone for playing along this week. Nice to read all the fun comments. This is a Cabinet Card that has been made into a Christmas Card. There is a #8 tag inside that can be pulled up using the bow at the top. The silhouette is the new Sizzix Alterations Carolers die. Once of my favorites from the new release. The background has been inked using the new Layering Stencils - Stars. Now add on my beloved red Vial Labels and the new Christmas Remnant Rubs and Mirrored Stars. Love it. Trimming - naturals, red and cream pk. The #8 tag pulled from the card with stenciled stars, a pine cone stamp from Winter Sketchbook, More Industrious Borders inked with Alcohol ink. Remember, it's the last day to comment on any of the posts this week to win one of the two signed messenger bags full of products. New colors of Distress Markers, Perfect Pearls, Stickles. Then throw in some new Ranger metallic cardstock and watercolor paper, idea-ology wordbands, skates + an apron and signed tote bag. There are even a few more things that you can't see in the picture!...Who wouldn't want a tote bag full of goodness? 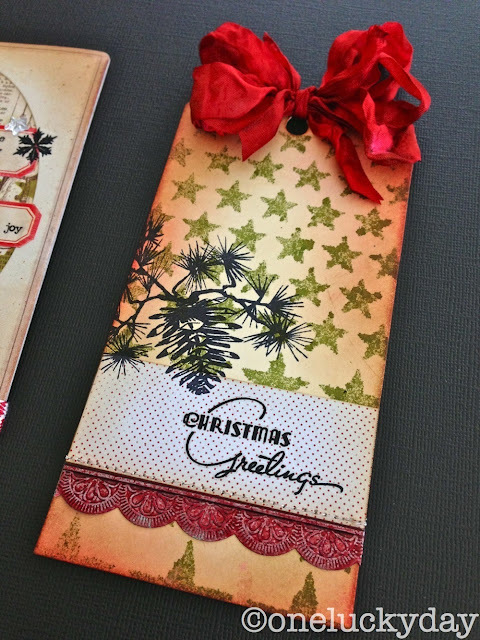 Such a pretty card and tag, Paula, I cannot wait to get my hands on the holiday papers and embellishments. In fact I am beyond anxious. Some day I am going to figure out how you get your bows that fluffy with such obvious centers. I use your technique and end up with a big hot mess of loops. I think I like todays card/tag best of all. These silhouettes really appeal to me. The card/tag is totally awesome! Love the silhouette. It's been such a delight seeing what you share each day on your blog using new releases from Stampers Anonymous, Sizzix and Ranger. And who doesn't love the opportunity to win a bag of goodies...it's like Christmas in July...only it's August! lol Thank you and to all those who contributed to the giveaway! and the chance to win such a wonderful prize pack. I particularly love the tag, but of course the card is great too! Such a pretty card! I love that metal tag! I've so enjoyed these posts! I'm kind of a newbie at card making, so your ideas really fuel my creativity! Thanks for sharing. Love the cards and the burlap panel! Everything you make is amazing! this is motivating me to start on my Christmas cards! Thank you for the inspiration. Still loving those industrious borders. Oh! I am soooo doing this for my Christmas cards this year! Oh this is too gorgeous ... I might need to start making cards!! I love the addition of the card. Awesome! I especially love that tag! Paula: Tks once again for the inspiration. I love the cabinet card. But the tag has its own amazing charm. I cannot wait to get my hands on those big word, word bands. May I also add that your colors choices are amazing, as always! I adore everything about this card! Oh my, I love this! What a delightful card for someone to receive. So glad I saw this post - thanks for the inspiration and the chance to win! Wow! What a fantastic card. Thanks so much for sharing your talent! The new silhouettes had me at hello - love them. Your creations are always so very beautiful, Paula! When I first saw this die I thought hmmm, what would I do with it, but seeing this makes we want it.! So many wonderful creations. Love how the tag is tucked in the card. Thanks Paula for sharing with all of us in blog world. What a gorgeous card, the silhouette diecut looks wonderful, but it is the embellishing that has me drooling. What a beautiful card and tag. I have just started getting into more of the mixed media and have had fun playing around with all the distress goodies. Your blog has given me a lot of inspiration. Thanks! Sigh - I just love the cabinet card turned into a Christmas card. And the new holiday rubs on the red labels - perfect! Can't wait until you show us more!!! Darling card and cute tag. I would love to win a bag full of goodies. Thank you for the chance to win. Good luck to everyone!!!!!! The Carolers die is one of my favorite from the new releases also! And those layering stencils...my oh my! I enjoy reading your blog. Your projects always inspire me to go down just a bit different path than I probably would have taken without your examples. Thank you ! As I scrolled down to the tag, I was still admiring that great card, and then I saw the tag! Wow! I don't know which I like better! I guess I can say I like them both equally. The red industrious border, the stars on the tag and the layout of tag, and the red vial labels - I love all those things. This is a Pin-it moment! 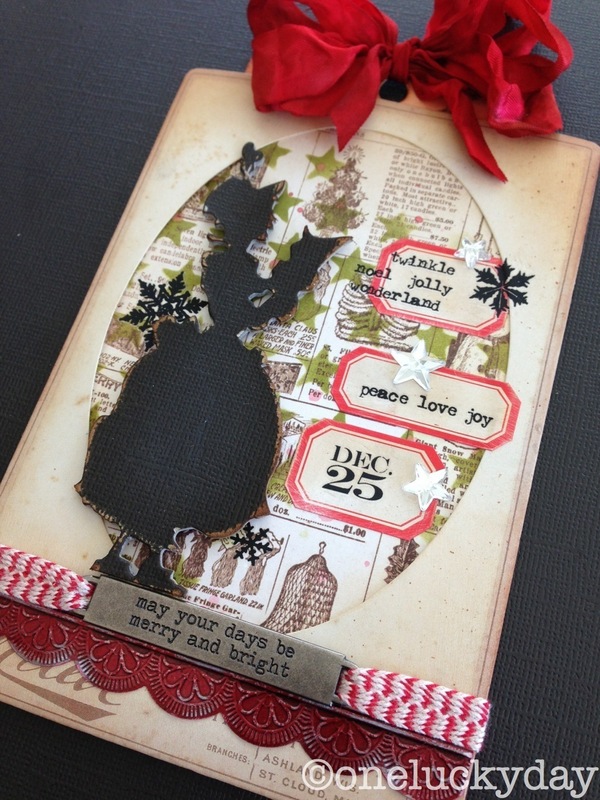 Oh, Paula, what a wonderful use of the cabinet card die and the new stencils! Thanks for all your inspiration. Great stuff, and very inspirational! Makes me want to crank up the Christmas carols and get to work! Your card is great but I love your tag. I love the very vintage feel of the tag - my fave - but your card is great as well! Oh my, I love the die cut carolers! Fabulous! Thank you for this great changpce to win some goodies! I collect carolers!!! And I can never find any wonderful cards - this is amazing!! Love the design of this card with the pullout tag. Could use the same idea so many ways. Thank you for the inspiration!love the Stampers Anonymous set! It's beautiful! First Christmas with my Sizzix and I can't wait to try it with all the holiday papers and dies! Would love to win all that goodness! Thanks for the chance. I love them all, but my favorite is the Christmas Burlap Panel because it is what Christmas is all about...Baby Jesus. I have been looking for something to make a manager scene for my Christmas cards for this year and it is so hard to find religious cut outs and dies. I do not know a lot about dies, etc. so it may be that I do not know what to look for. I think your Christmas Burlap might be the closest I can get for something beautiful and religious. Thank you so much for the idea and the chance for the good things. Oh my, this is such a special card - love the tag too! Thanks so very much for the chance to win such a wonderful bunch of goodies - it would be like Christmas in August!!! I love the whole project but especially the pull out tag. What a wonderful surprise! Your card and tag are really pretty. Looking forward to all the new things for Christmas card marking. LOVE this card!! It has some of my favorite elements, including the new Caroler die, the red vial labels and those fun mirrored stars! The pull-out tag is fun too. Thanks so much for the chance at your giveaway! beautiful! so many wonderful new additions. Love the stencils and the sillouette caroller. the whole thing is adorable! Wow Paula - you have been an inspiration to me for the last couple of years and you just keep getting better and better!! I love when I get an email saying you have posted something new - keep up the good work - I LOVE IT ALL!! I love everything about this card....I don't have these new products yet, but they sure are at the top of the wish list. those green stars are such a surprise. how fun! Love this card and the tag is so sweet and fresh! I'm loving the look of the vial labels...and those Industrial Borders are so awesome!! What a beautiful card!! The new Christmas papers, remnant rubsxand dies are going to be so fun to work with... will make my Christmas cards easy to design! WOW!I just love the red industrial borders and the effect of the star stencil showing through. What a gorgeous creation. I've been so sick all week that I haven't kept up with my emails, so I am very grateful that I opened this one and saw your beautiful card/tag and the generous giveaway you are offering. I hope I made it in under the wire! Thank you for the inspiration and the chance to win these wonderful prizes as well. I have this stamp set and have never used it. Thanks so much for the inspiration. Love the card! I enjoy all your posts. Love this card. I have wanted this die. Now I think that I might have to get it. Very classic card. All the cards are gorgeous! Loving your cards! I love that new caroler die. Your work is so inspiring. I keep a folder of most all your work to look back on. Gorgeous cards, thank you. How wonderful. Love the card and really love the tag beneath it all. Thanks for a week of great ideas. Christmas here I come. Not normally loving Christmas this time of year but those cards and panels definitely put me in the mood. Love to get a head start.. Pick me! Pick me! Love your card and tag! I really like those silhouettes. Makes a very stunning card. Awesome work. Love all of your themes. Thankyou for sharing such creative thinking. Look forward to your posts. I love this idea, I have some of those cards and didn't know what to do with it. Now I know. Thank you Paula for this inspirational week and the chance to win this fabulous price that makes me nervous and exited. I love making tags and that's a really good way of including one in a card. I always love visiting your site, so inspiring. Can't wait for some of these new products to hit my LSS. Thanks for the inspiration! Wonderful!!! I love the silhouette!! Oh, yes please. I love love love everything (always!) on your blog. You are such an inspiration. Thank you! Delightful! I am so excited for holiday crafting! I love the Christmas Greetings tag! Can you tell me where the greeting stamp came from?? julie, that is not a stamp, it is part of the rubbing sheet. There are two new Stamper Anonymous stamp sets that have the stamp, Deco Christmas and Mini Holidays 5. They should be coming to stores soon. Beautiful card and I LOVE the tag. I have to go try it now! I can't wait to use some of the new releases for the holidays. What a beautiful card! I wish I could be a fly on the wall in your craft room and learn from watching you create these beautiful pieces! you truly are an inspiration!! Gorgeous! I love your work. Just found you from a pin on pinterest. I fell in love with your sweet work and thought to see if you teach any classes in my area. While I don't live near any of your teaching sites, I was happy to see that you will be at the Junk Bonanza, I will try and find you there!